I really make this book so cheap that anybody can buy because I want this book to help as many people as possible. Are you ready to have fun ? let’s get started! I am an exercise enthusiast. But I always like to try new stuff like yoga, free weights, machines, etc. To change exercise will increase your motivation and it will make you want to exercise more because you enjoy more. So this is my first book. I want people to work out correctly and get the body that they want! 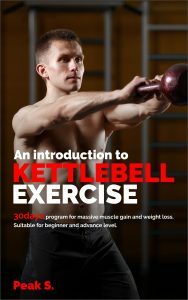 The kettlebell is one of Russian military best exercise equipment. It helps increase stamina and strength. It will be one of your best books to help you start on this new equipment. It will have a calendar for your first month, it will kick start you quite well. You will see your better shape in 7 days! And you will truly see your best shape in 30 days!